Here's a bit of a twist. My response to today's prompt of "going solo" is actually about a solo going in partnership. Yeah, when I saw the prompt, I immediately thought of Napoleon Solo. Remember him? I'm probably showing my age here but Napoleon Solo was one half of the television team known as The Man From U.N.C.L.E. U.N.C.L.E. was an American television series that ran for 4 years on NBC in the mid-60s. I remember watching it. It was a serious - more or less- counter-balance to the not-so-serious Get Smart which I also watched without fail. Solo was the character portrayed by Robert Vaughn. The series initially was to be built around him and was developed by Ian Fleming. Yeah, that Ian Fleming. The man responsible for James Bond. Turns out, though, that a scene featuring a Russian agent named Ilya Kuryakin went over well with viewers and so the two were paired and the rest is history. Kuryakin was portrayed by David McCallum who, these days, portrays "Ducky" on NCIS. The thing I remember about McCallum is his haircut. Nobody I knew - on TV or in real life - had a haircut like that. It was pretty special. This was much more fun than going solo! See who else is flying solo via the links at We Work For Cheese. And check out this week's Pause Ponder and Pun caption contest at dufus daze. I loved that show! Very entertaining. These guys were so suave! It had a little sense of humor, but wasn't over the top like "Get Smart". Huh! Never heard of it, and I am 46! I don't know that show, but I do remember watching reruns of Get Smart. Maybe that is where Han Solo got his name?!?! I remember that show. I always watched it. We had a few 'double act' shows that came along after that one. It was a winning formula. Me too Me too. Guess we are all revealing our age here, hun. I've heard of the show, but never watched it. I did watch the wacky Get Smart. I enjoyed the clip, and the chance to see Ducky when he was younger. I see it every once in a while still running on some channels. I didn't remember the name Napoleon Solo. I occasionally watched the Man from U.N.C.L.E. but not regularly. I remember more about Get Smart. Seemingly I was a fan of stupid TV shows even back then. Ha" I watched both, ``Get Smart`` and.`The Man from Uncle`. They both reminded me of all those espionage movies and series of the day. Sorry my friend, I have NO IDEA who Napoleon Solo is! 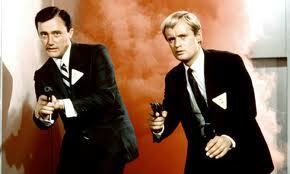 I can't remember if I watched "The Man from Uncle." Definitely showing my age. But, oddly, I remember watching "Get Smart." Was that Solo or Sulu? I saw a few 'Get Smart's, but not a single UNCLE. Kinda feel like I missed something now. Nicky, have you been told today? Solo was Uncle. Sulu was Star Trek. And Get Smart was hilarious. Oh, you should check out You Tube. I loved how both shows were take-offs on the more serious spy shows and movies Like I Spy and James Bond. The stupider the better, eh. Really? It might be a worthwhile DVD set to get. I have the Get Smart series on DVD. Watching that damn intro over and over again gets a little boring though. He was quite the heartthrob wasn't he. Ah-ha. You're secret's safe with me. It was a cool show. I agree. Yeah, you're right. It was more like I Spy with Bill Cosby and Robert Culp. Remember that show? Um, never mind. I'm far too polite to tell you. I loved that show! Also loved Miami Vice! Oh, yeah, Miami Vice was pretty cool.